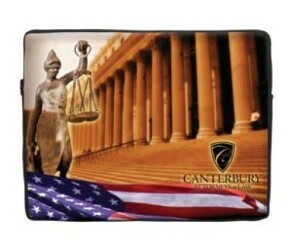 Our Laptop Computer Sleeve Covers are made of high-quality neoprene (Wetsuit Material) that are 1/8" thick and stretchable and are available in three sizes. The three available sizes are 9.7" X 6.8" X 1 1/4:, 10.8" X 14.2" X 1 1/4" and 12.4" X 14.6" X 1 1/4". 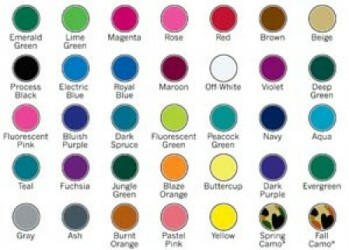 There are 35 different Neoprene colors (see below) to choose from. Minimum custom imprinted quantities are 12 and up depending upon the size, style and the quantity of colors to be printed. These are great products for conventions and school fundraising. 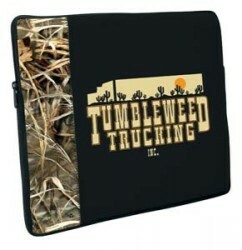 Pictured below is a solid color laptop sleeve cover. 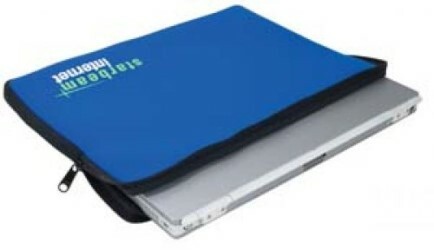 This is an example of a two-tone laptop computer sleeve cover. 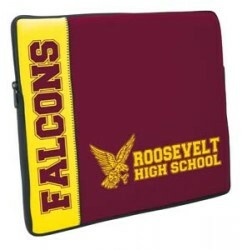 We can do a full color laptop computer sleeve cover with your four color process artwork. This is an example of a stock design(on the left) with a custom imprinted sleeve cover.